With pleasure I can announce that 12-7-Games.com has agreed to renew its sponsorship of Wargaming Recon for another year. Their support is invaluable to our mission of sharing historical and New England gaming with you through our podcast, Wargaming Recon. 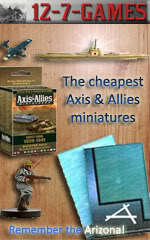 If you are looking for the best online vendor for the cheapest Axis & Allies minis on the net, then look no further than 12-7-Games.com. They are a dream to deal with because of their stellar customer service. I’ve purchased cases of War at Sea minis from them and they’ve always shipped the models quickly in secure packaging. Whenever I’ve had a question they’ve always responded quickly. Bill Dettmers, the owner of 12-7-Games.com, consistently goes the extra mile to provide the best shopping experience for his customers. Please consider 12-7-Games.com for your gaming needs and tell them Jonathan sent you. You won’t regret it. I promise.